Check in was easy…after a couple of drinks in the departure lounge, boarded the flight to Dubai…and plane took off at exactly the scheduled time of 22:30…. 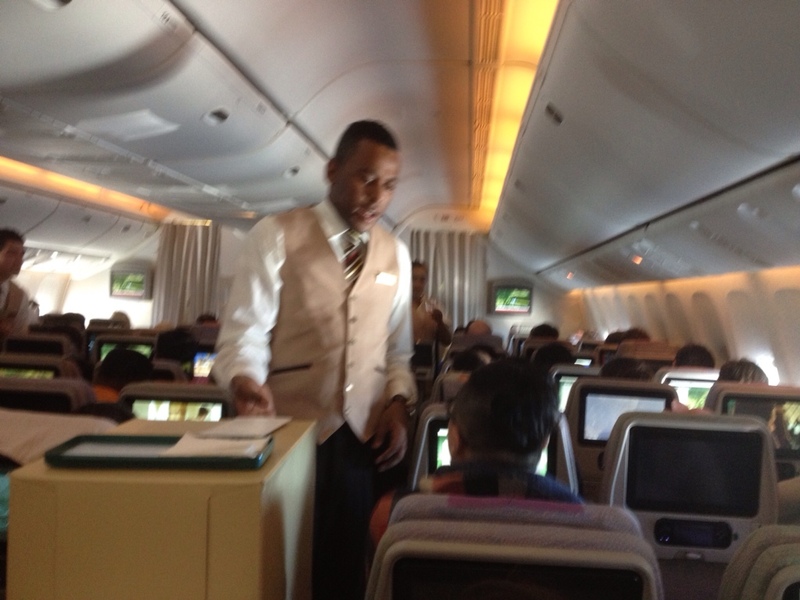 it's a full flight….and blessedly, not a child in sight !…..and well here I am…we are…. still waiting for a drink to be served and it's now quarter past midnight….but hope is at hand…almost within reach even….the hostie with the drinks trolley is now so close I can see the whites of her eyes…mind you, she has taken at least 20 minutes so far to serve just 5 rows…is she the slowest person ever in charge of a drinks trolley… so at her rate of pouring I could be in Dubai before she reaches us … this must be part of the 'responsible drinking' strategy of Emirates…slow down the service so much, that between drinks you get plenty of time to achieve sobriety again… Yineka-mou tells me that it's my duty to inform my Brother-in-Law GJ about the slow ( but responsible) service of alcohol, as he's due on the same flight next week….and GJ has a solid reputation for impatience… you could even go so far as to describe his behavior as intolerant sometimes, especially so when it comes to getting between prompt delivery of a glass of liquid refreshment and he. Good Luck with that GJ!! OK… drinks have at last reached us…. white wine for YM, red for εγω…. Cheers, Adios and Buenos Notches….thee you in Bar-tha-lona si? Just love your blogs TT, keep them coming. It’s the next best thing to actually being on hols too. ps. 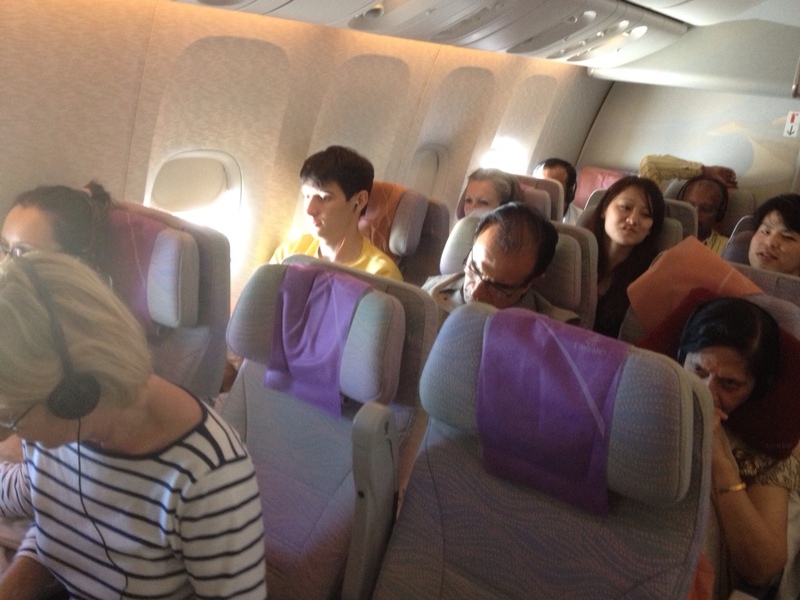 looks like YM had to sit next to people, I bet she wasn’t very happy! pps. did she share her wraps with you?